Organic wool knitting yarns are just as durable and beautiful as yarns that contain synthetic materials. Organic wool yarn comes from sheep that are raised on an environmentally friendly and sustainable farm. Some organic wool purveyors operate and own the farms that produce their wool, while others purchase the wool from organic sheep farmers. Raising sheep organically for wool is much like raising any other organic farm animal. The farmers do not use harsh chemicals such as pesticides and insecticides. These sheep are not treated with any sort of hormones and many farms that raise sheep for organic wool allow the animals to roam free among the pastures of the ranch. Additionally, the dye used to make the endless number of colors available for organic wool yarn is also much more eco-friendly than the dyes used for traditional yarn. Even though the dye is considerably more eco-friendly, many organic wool manufacturers choose to leave the wool undyed, in its natural state. One of the most important factors about organic wool is that the sheep are treated in a humane manner and are not subject to a practice called mulesing. Mulesing is a gut wrenching process that some sheep farmers use in order to treat the animals infested with flies that lay eggs within the folds of their skin. When the infestation begins, this is called "flystrike". In order to treat flystrike, the farmers tie the sheep's legs to metal fencing and cut the piece of their flesh off that is infested with fly larvae. This practiced is so disturbing that large companies like Adidas, Perry Ellis and Hugo Boss to boycott wool from sheep from farms that practice mulesing. O-Wool - One of the largest manufacturers of organic woo, O-Wool products are certified by the U.S.D.A. National Organic Program Livestock Production Standard. Royal Yarns - This company offers a wide variety of organic wool from different manufacturers such as Rowan, Filatura and Tahki. Treliske Organic - If you are looking for the difficult to find eight-ply black and brown organic Merino wool, Treliske is the company you need to check out. Diamond Yarn - This company offers a variety of organic wool in a number of different colors. Jimmy Beans Wool - While checking out the organic yarn offered by Jimmy Beans Wool, take a quick peek at the organic soaps and shampoos they have to offer. Yarn County - This online store offers organic wool products from couple of different companies at a slightly discounted price. Organic wool knitting yarn is just as durable, if not more durable than inorganic yarn. Without the use of harmful and toxic chemicals on the organic farms, these chemicals do not leech into the sheep's wool through their diets. Often times, it is the chemicals within non-organic wool that causes it to breakdown and wear prematurely. As long as you care for your organic wool knitted items properly, they should continue to look as beautiful as the day you finished knitting them. The organic textile market is still relatively small, but continues to grow. As this happens, the price begins to come down. The textile market accounts for a large percentage of pesticide use in the entire world. Cotton alone is responsible for nearly 25 percent of pesticides and herbicides around the world and uses nearly 500 gallons of water to make one t-shirt. 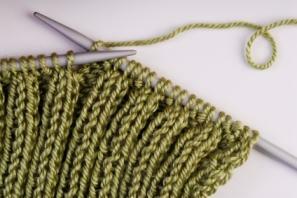 For these reasons as well as the others, the next time you get the itch for a knitting project, consider being kind to the planet and choose organic wool or cotton.